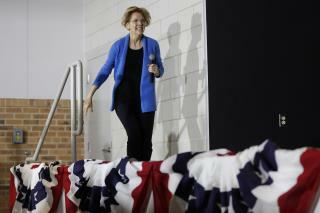 (Newser) – Sen. Elizabeth Warren wants to be the Democratic nominee in 2020—and she's not sure who her Republican opponent will be. She told a campaign event in Cedar Rapids, Iowa, on Sunday that every day brought "a racist tweet, a hateful tweet—something really dark and ugly" from the president and wondered if it was worth chasing after them every day, Politico reports. "Here’s what bothers me. By the time we get to 2020, Donald Trump may not even be president," she said. "In fact, he may not even be a free person." A day earlier, when Warren confirmed her 2020 White House bid, Trump once again mocked her as "Pocahontas" with a tweet that some said invoked the 19th-century "Trail of Tears." I don't get how this woman ever made it up the ladder to her current position. lunacy.